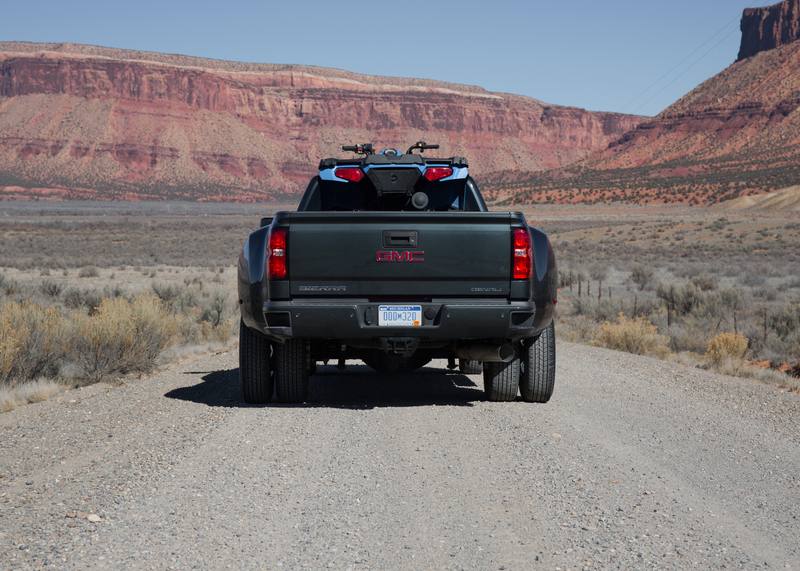 It’s hard to believe the GMC Sierra 2500 Denali HD now boasts 910 boat-tugging, snowmobile-hauling lb-ft. of torque. In layman’s terms, that’s a lot of pulling power. The revised output represents a 19 percent increase over what last year’s Sierra Denali’s turbodiesel V-8 (765 lb-ft.) could muster, and it’s the result of an ongoing war for bragging rights among heavy-duty pickup manufacturers. The space for ultra-luxurious and capable pickup trucks is becoming more crowded. Late last year Ford announced its Super Duty pickup line would have 925 lb-ft. of torque. GM could hardly sit idly by. That explains the respectable gains by the Sierra HD and the more luxurious Sierra HD Denali, as well as its close sibling, the Chevrolet Silverado HD. But what is it like to climb in and take the wheel of the GMC Sierra 2500 Denali HD? Surprisingly easy. Despite the Sierra HD Denali’s size, maneuverability is not an issue, with light steering effort and a gentle throttle. When you need to dip in to the massive cache of torque, all it takes is a stomp on the gas pedal, and the pickup comes to life. The 445-hp Sierra Denali HD makes light work of hauling adventure-driven toys in the back, from skis to snow shovels to snowmobiles, and can tow over 14,000 pounds of whatever needs its own trailer. Press the switch for the exhaust brake to give your rotors a break on particularly steep inclines. There were plenty of elevation and speed changes along the route in Colorado where we tested the Sierra Denali HD, but we saw an indicated 17 mpg for much of the trip — even with the aforementioned ATV tied down to the bed. Multiply that out by the pickup’s 36-gallon capacity for diesel fuel, and you could drive from Boston to Pittsburgh without refueling. It rolls over broken bits of tarmac with passenger car-like levels of vibration, which is to say not much at all. Apart from the addition of a more powerful engine, the rest of the Sierra HD Denali is hardly “new,” but it does sport a number of cool technological touches that keep it competitive. Flick on the turn signal, and the center display shows a rearward camera image in the same direction — useful for towing, as well as sliding into tight parking spaces. Curiously, the Sierra HD Denali also features Teen Driver, General Motors’ technological advancement aimed at keeping tabs on younger drivers, as well as keeping them safe. The supervising adult can view how many miles the truck has traveled, place limits on in-car audio, and set an arbitrary speed limit. But would you let your newly licensed youngster take your loaded work truck for a joy ride? The Sierra Denali HD’s only relative shortcoming is its interior, which feels like an afterthought in such a powerful machine. From a truck with a sub-$70,000 price tag before options, we’d expect a little more than leather trim and the occasional splash of wood grain. Plasticky switchgear reminds us that this is not a Cadillac, but the cabin is quiet, and there’s plenty of room and power ports for five.